What that about then ? Kas decided she’d really, really like to run the 40th Berlin Marathon on her 40th birthday weekend. It seemed like a reasonable idea. We booked all of our flights and our hotel using some of my many thousands of BA Air Miles ( or Avios Points, whatever they’re called now ) as this seemed to be a sensible option. What wasn’t so sensible, though, was that the direct flights to Berlin that weekend were all booked up for Air Miles already so we ended up having to take a less direct route, which involved a BA flight to Dusseldorf and then a change to partner airline Air Berlin for the flight over to Berlin. Not only did this mean an unwanted landing and take-off, but it also pushed the price up to a level where EasyJet might actually have been cheaper (normally they aren’t, once you add in bags, and wanting to sit next to your wife).. Why ? Because each leg of the air miles flight requires payment of the taxes, and the taxes are about 99.99% of the normal listed price anyway. Chunter, chunter. Next time we should either book earlier or fly with someone who doesn’t do air miles. Having said that though, both legs were nice short one-hour hops with a drink and snack included, and essentially unlimited baggage, and the terminal wasn’t busy, and the bags made it OK.
Incidentally, while we were doing this, the kids were being looked after by my parents. We arrived in Berlin in some semblance of daylight and jumped fairly quickly onto a regular service bus that was going where we needed, the Best Western on Kantstrasse. It took about 15 minutes and then a further 10 minutes to walk from the bus stop. So far so good. The room booking was in place and the room was OK, and we had a bit of time for a quick snooze. In the evening we met up with the “tribe” from Redway Runners, most of whom were staying “out east”. To get there we caught the S-Bahn from Charlottenburg into Zoo Station – queue some quoting of U2 lyrics on Facebook. I most certainly was “ready for what’s next” by that stage, although it wasn’t laughing gas. We met the Redway Runners posse on Kurfürstendamm and went to a fairly busy restaurant-pub. So “what’s next” for me was a couple of glasses of nice beer and a local delicacy that involved some sausages, sauerkraut and mashed potatoes. It was lush. Kas was doing her best to not look jealous as she was sipping her way through non-alcoholic beverages. We grabbed a decent breakfast at the hotel fairly early, as we’d got to get ourselves off to the Marathon Expo, for collection of numbers, purchasing of unnecessary running equipment, and things like that. It was also Kas’s birthday. Happy birthday to you, etc ! The Expo was being held at the old Templehof Airport on the south side of the city centre. It was a par two or three by S-Bahn and U-Bahn from where we were staying so it took a while, and Kas wanted to be there fairly early to beat the rush of people trying to collect their stuff. Fair enough. We arrived there on a beautiful morning and joined what could probably be described as a throng of people (how many people are needed to constitute a “throng” – or does it depend solely on how much noise they’re making ?) waiting for the doors to open. When they did open there was, quite frankly, a faster start than there was going to be on the morning of the race. And Templehof being what it is, we also had some considerable distance to cover before reaching any bits of actual “Expo”, and then the number collection point was at the very furthest end. I was glad I didn’t have a marathon to run the following day. Anyway, shopping in a crowd of runners for things I don’t really need or want isn’t my idea of a fun morning, so I agreed with Kas to meet her back at the entrance in “a couple of hours” while I went off caching. Once I’d found the end of my ball of string and followed it back to the entrance, that is. Except the ball of string trick didn’t work because I wasn’t allowed to leave through the same rooms I’d entered by (in case I got trampled by the throng, presumably), and I had to leave via a different route. This new route took me a bit further along some of the old airport infrastructure. For the first but not last time of the weekend I marvelled at the monstrous scale of the architecture. It really is a huge building but, in my opinion, not a very pretty one. It’s not very nice to look at, even if it is big. In fact I think that was the point. Such things were designed and built to look and be permanent rather than pretty. I eventually managed to find my way to the door where we’d come in and so was then able to follow a more or less clockwise route around the old airport doing the tupperware-shuffle. This part included walking the entire length of one of the old runways and it enabled me to take some pretty good photos in the bright autumn sunshine. The now closed airport hasn’t been chopped up and redeveloped, but instead has been turned into a public park and more or less left to its own devices. All the original taxiways and runways are still there, albeit a bit weed-covered in places, and it’s full of people running, walking, jogging, rollerskating, sitting about drinking beer and any number of other things that are traditional in urban parks. Including hunting for tupperware. I won’t say it was a rich vein of tupperware for me though. I’d solved a load of puzzles beforehand (with considerable support from the CO) but failed to find quite a few of them, and overall I had the feeling that I’d walked much further than my find count indicated. The race was due to start on Straße des 17. Juni in Tiergarten with the course initially running out west (away from the Brandenburg Gate). Kas decided she’d like to go and check out the form up there to make sure we knew where we were trying to get to in the morning, which seemed fair enough. To get there from Templehof Airport we took the U-Bahn straight up to Stadtmitte. This is one of those weird stations that was shut during the Cold War as it’s on a line which links the American Sector with the French Sector but happened to cross underneath the Soviet Sector, and hence during the Cold War it passed under the state of East Germany, I rode on that section once on my only previous visit to Berlin in late 1987. It was strange. Anyway, you can now exit the station and it’s a short walk over to Pariser Platz and the gate. It was too long a walk for us to complete without taking a coffee and sandwich break though. All the coffee shops here were packed, and we were fairly lucky to find a small table at the back of a “local” coffee shop (rather than a big American chain one). From here we wandered through the Brandenburg Gate and had a mooch around the start/finish area. I tried to find a couple of caches but to be honest everything was closed off with barriers ready for the race so I thought I would look far to suspicious trying to do much up there. Kas was carrying a teddy bear that one of the kids had gained custody of for a period of time (one of the school bears, awarded for good achievement or efforts during the week). So for some reason the kids wanted us to bring this one to Berlin rather than looking after it themselves, so it travelled all the way over here with us and had its photo taken at the Brandenburg Gate. At this point we decided to separate for an hour or so. I wanted to go grab a few geocaches in Tiergarten and Kas didn’t want to do much if it involved walking, so she mooched up and down the start aea and found a coffee stall while I dashed off into the park southwards to grab a couple of nearby caches, with somewhat more success once away from the race area. When we met up again we decided to have a leisurely and slightly touristy wander down to Potsdamer Platz, which takes you through areas that have changed radically since the wall came down. They have laid a set of brass sets into the roads and paths so that it’s possible to follow the line that the wall used to take. When you’re at Brandenburg Gate you can’t help but notice how close the wall actually was to the gate. On the way down the street you also pass the Memorial to the Murdered Jews of Europe. This is a very modern structure consisting of a number of concrete blocks of differing heights but roughly the size of a coffin. They are laid out in regular arrays with walkable paths in between and the effect is quite spectacular if you walk through the centre. The idea is to induce a sense of disorientation. It takes up a big chunk of a city block and is well worth a visit, but after reading the Wikipedia page it’s obvious there was, and still is, a lot of controversy about it. 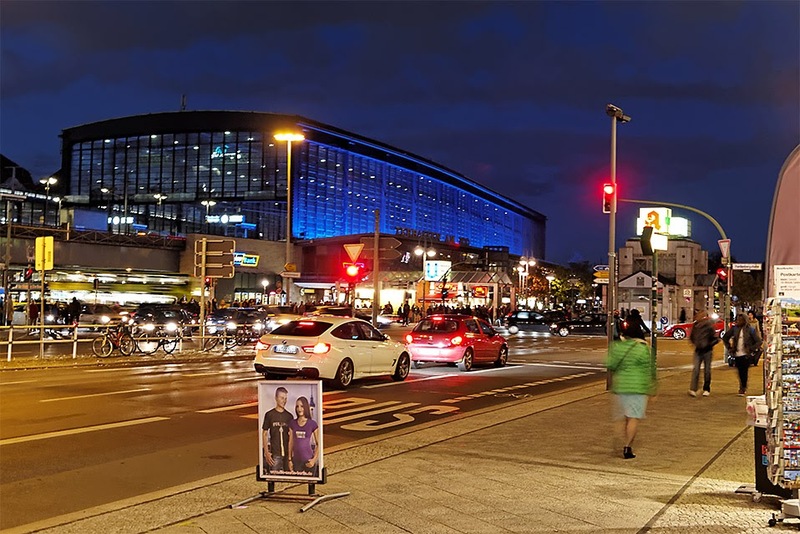 We took the short trip back from Potsdamer Platz back to the hotel and when we got back Kas was ready for a bit of a late-afternoon snooze so I scooted off caching again, this time planning to try a few urban caches to the west and south of our hotel. Aside from meeting a German woman who was holding one of the caches I went looking for, and apart from standing in a massive dog turd, it was another unremarkable and fairly unproductive session of 4 finds but at least as many DNFs. At some point I realised the time and had to say goodbye to my temporary caching buddy and get back to the hotel, where I had time for a quick shower before we went to a fairly simple Italian restaurant along the main road from the hotel. It hit the spot, and we were done early enough to get back for a nice early night. We had to get up frighteningly early in the morning as Kas’s wave set off at 9am, so she needed to be up and ready in the marshalling area by 7:30am at the absolute latest. Race day started disgustingly early for a Sunday morning, but not, apparently, too early for the hotel breakfast bar. I think they might have had a few other marathon runners in the building. We had to be up at the start for around 7:30am to allow for general crowd confusion and still get up to the start line for 9am. Well, Kas did, I didn’t. We took the U-Bahn up to Brandenburger Tor, the closest station to the Reichstag and the event area where we’d agreed to meet our club running buddies. It was a bright morning, but very cold. Very, very cold. I don’t think we’d catered for it being quite that cold. Nice for running. Rubbish for standing around. The club running buddies all turned up quite late, so Kas was busily stretching and keeping warm and eventually decided that she was going to have to go into the event village to hand in her bag. Just as she decided that some of the running buddies arrived, so we had a brief group discussion before they decided it was time to go. Once they went to the baggage drop they were inside the event village and I couldn’t go there, so we said our goodbyes and I set off on my geocaching expedition while Kas was doing her running. There wasn’t much of a plan, except that I had a copy of the course map, a phone full of caches to look for and an online “stalk-the-missus” app that wasn’t working. I only got it to work after uninstalling it and reinstalling it. It seemed as if it needed to be installed while the race was actually in progress – I initially installed it the night before and on the morning of the race as I was plugging in Kas’s race number it came up with a scheduled starting time and then confirmation of actual start time, and then it stayed that way until I decided to try the uninstall/reinstall technique, which was about halfway through her race. It was also a bit rubbish in terms of the information given. Initially I had that actual start time, but after the install I had Kas’s running time through various checkpoints but didn’t have her start time any more, so whilst I knew she was progressing well I wasn’t able to tell the time on my watch when she’d be passing particular points on the course. Anyway, my route took me along the River Spree, and then down onto Unter den Linden, down to Französischer Dom, along the Spreekanal onto Leipziger Straße, then down past Checkpoint Charlie, the Jewish Museum and onto Yorckstraße. Somewhere along Yorckstraße I tried to wait to see if Kas ran past me, but after 20 minutes wait I concluded I must have just missed her, so I moved on feeling slightly disappointed with myself for having taken so long to get here. It was at this point that I decided to reinstall the “stalk-a-punter” app on the phone, and this time it worked straight away. I was now getting to the point where I wouldn’t see Kas at all unless I got a shift on, so I hot footed it over to Hauptstraße, where I thought I’d be able to catch her at around the 37km point. In the event I got there maybe only 10 minutes before she did, but thankfully I got close enough to the front of the crowd here to be able to see her, and for her to be able to see and hear me. So I managed to give her a final shout of encouragement as she entered her last 5km. At that point I also realised it would be highly likely that she’d get back to Brandenburger Tor well before me. She had 5km to run, I had to get into a U-Bahn station through the crowds, wait for trains to take me 5 stops on 2 different lines, and then climb out and get through the crowds at the finish to find her in the waiting area. No hope for me then. It’s just as well it took her a while to get through the finish line and back to the waiting areas, else she’d have been waiting ages for me. As with the previous day I seemed to have walked a very long way for not very many finds. There were hopelessly busy spots, concrete canyons with no signal, obviously missing ones and a couple of just horrible locations that I didn’t pursue for long. I guess urban caching is a different game to countryside caching. I did eventually meet up with Kas at the waiting area, where I discovered she’d finished in a new PB of 4 hrs, 3 minutes and something, and we then fought our way through the crowd round towards Brandenburger Tor where we gave in to the need for lunch, and had a large beer and an equally large chunk of pizza. Lush ! After our pizza and beer, well earned in my case and very well earned in Kas’s, we sauntered down to Potsdamer Platz again (“sauntering” maybe sounds a bit speedy, let’s correct that to “moseying”) and rode the U-Bahn back to our hotel. It was busy with sweaty runners. Back at the hotel Kas had planned a gradual cool down involving the bed and several packs of Party Rings. We had a Sunday evening appointment with the official race party, which was being held in an old East German theatre now converted to a hopelessly trendy nightclub place over on Karl Marx Allee on the eastern side of the city centre. To get there we caught an S-Bahn around the top and through the Hauptbahnhof and down to Alexanderplatz. We had to change trains here and as we were in no hurry we decided to go look around for something to eat. Neither of us fancied anything posh, so we ended up in one of the least posh places you could imagine, eating sausage and chips, a Currywurst in my case. It was ideal preparation for beer. We found the venue for the party and mooched about a bit, waiting again for running buddies to arrive. This time they were sufficiently late that Kas and me retired to a nearby bar to shift a beer or two while we were waiting. It was a weird kind of a place. The staff had an apparent aversion to smiling and later on, when all the others joined us and decided to order food, they had a surprisingly unhelpful attitude towards a group of ten (OK, slightly loud) people sitting in their otherwise totally empty establishment on a Sunday night. You’d have thought they’d got somewhere better to be. Anyway, you can tell from the photos here that the bar and nightclub venue were well placed for nice urban landscapes. The after-race party itself proved to be an extremely sweaty, quite noisy and seemingly endless series of queues for getting to the bar, or the toilets, or the bar again. And I had to pay to get in – something about me not having run the race. But once we were all suitably provisioned with beer we made our way into the main hall just in time to see the official award ceremony, which included a good light show, lots of self-congratulation, and then lots of applause for the leading men and women, and especially for Wilson Kipsang of Kenya, who won the men’s race in a new world record time of 2:03.23. After the awards though we both started to feel a bit the worse for wear so we took the decision to scoot back to the hotel, leaving the running buddies there for a few more beers. The morning after was a bit slow as Kas was feeling rather stiff, so we had a leisurely breakfast in the hotel whilst deciding what to do for the 3/4 of a day we had to fill before our flights home. Initially we decided we’d go for a look at the Charlottenburg Palace, which had a couple of quick caches and some very grand gardens and buildings (once we’d found the way in). It also had a nice little coffee shop over the road, which we were ready for after a couple of hours. It was sunny again but breezy and really quite cold, and neither of us really had much in the way of warm clothes with us. After the palace we decided on a trip to the Olympic Stadium. It was a bit of a hike up there on the bus and then a bit of a walk from the place the bus dropped us off, but once there it was quite impressive in that neo-Roman block style that Hitler was so very fond of, and that we’d seen the previous day at Templehof Airport. We were surprised by the amount of money they charged to visit what is essentially an empty stadium, but we decided (again) that having come here we shouldn’t shirk over a few Euros. Once inside it justified the expense. The contrast of the newer fit-out of the blue running track and the roof against the massive pillars and blocky stone style of the stadium superstructure is very stark. They’ve left a few of the other original features in place too such as the swimming pool and the open parade area, plus an absolutely huge bell. These older items enhance the historical feel of the place and serve to emphasise the strangeness. From the outside it is most definitely from the Nazi era. From the inside it’s much more difficult to tell that. It could be almost any stadium in any European city. I read that the design of the 1972 Munich Olympic Stadium was deliberately flowing, open and random to emphasize the “new” Germany in stark contrast to the stern and heavy looking architecture of the Berlin site. At this point though, we became conscious of the time and decided we really needed to get away, so we walked as fast as Kas could manage to the nearby U-Bahn station and sped over to our hotel, where we picked up our bags from the left-luggage cupboard and proceeded directly out to the bus up to the airport. Airport check-in was all fine but somehow we were late into Dusseldorf and would have missed our connecting flight except, of course, that they had our bags on board and it was an “official” connection, so they had to wait for us. We were going as fast as we could through Dusseldorf Airport but we still sensed some grumpiness amongst the other passengers when we made it to the plane, as we’d made them all wait for a while. We were slightly surprised and relieved to see our bags being stuffed into the hold beneath us as we sat down too. From that point onwards it was all fairly easy. We got to London, the car was where we left it, the kids and my parents were where we’d left them, and home was very much home. That was an excellent weekend by most standards. I found 25 geocaches in a country I’d never cached in before and Kas smashed her marathon PB by some huge amount. And we had some good beer, sausages and cake.